I recently found out about the existence of the 1.21 patch, and applied it to my game. Things work beautifully, except for one thing: HUD elements appear to be stuck in their 640x480 size no matter what the resolution of the game screen is. 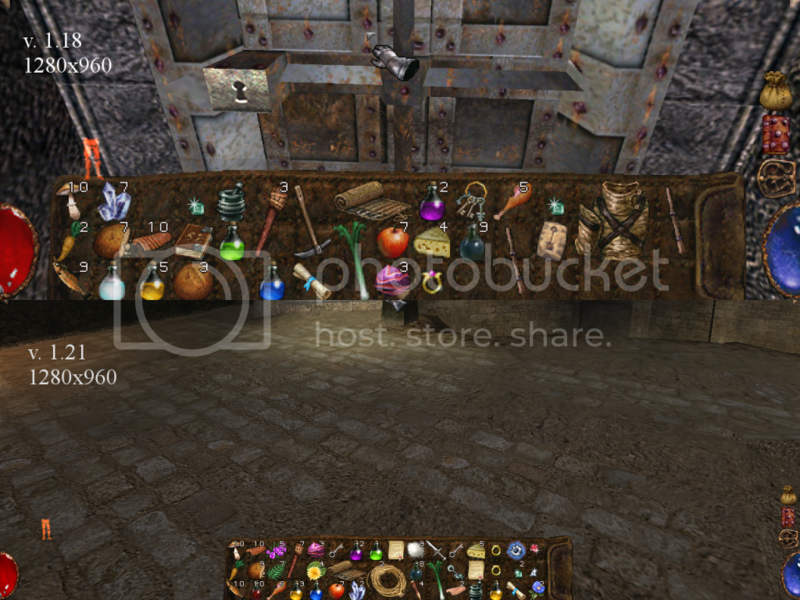 Thus, at 1280x960 the inventory, health and mana meters etc. appear one quarter of their preferred size. I never had this problem with 1.18. Any idea how to fix this? Have you tried the Arx Liberatus patch? It should fix that and more! Hope this helps! I thought Arx Libertatis is an open-source engine or something, not a patch. Well, it's both. The code is based on the original Arx Fatalis, just ported to Linux and other systems and with some improvements. So it's not that different from a patch, just not made by Arkane. In fact, it made it slightly worse: before, the mini-map in the corner at least scaled, but under Arx Libertatis it does not do that. Uhm, that's a bug. It might be time we got around to fixing that. Scaling the UI is definitely something we want to do in the future. However, the UI is one of the messiest parts of the code, so I'd rather not work on that yet. Anyway, as I couldn't find an existing feature request on our bug tracker for this, I created feature request #391. Edit: Looking at the code, most of the infrastructure to do the scaling is still there, so it might even make it into the next AL release - but even that will likely not be anytime soon. Last edited by dscharrer; 1st Oct 2012 at 19:57. Wow, I did not expect a response from someone directly involved with Arx Libertatis. Thank you for your answers. I'll just have to weather through this problem then. Same issue on 7-64 but somehow it corrected it's self and has only popped up once when importing a save game file from another drive with xp 32. It eventually reset but as to how? best of luck... I remember having the issue when first updating to the 1.21 patch but when I looked for my old disk the grand kids had made off with it so I bought the game from gog and it worked... I don't know if there was an issue with the update or not. So good luck and if all else fails try re-installing it, or rebuy it with the patches already installed from Gog or steam? Thanks Joseph for your advice to Crowley as it may be useful to other people who have the same issue.